Instead of squandering your saving for instant, already-made organizers available at IKEA, install one on your own with these space-saving and creative DIY vertical organizer ideas for small bathroom! 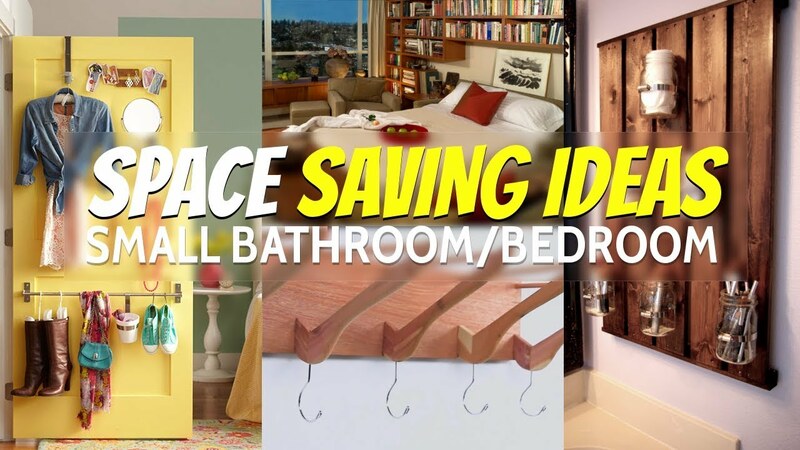 You will save money and space at the same time!. More about that later because it’s time for your 10 creative vertical space saving ideas for small bathroom (10-6) and bedroom (5-1). Organizers don’t always have to be on a display. If you don’t want to fill the entire of your bathroom wall with furniture then consider the back of your cabinet doors. Attach space-saving bins on the door with nails and keep your flat irons, blow dryers, brushes, nail clippers and bath items there. Source, Youtube video , Nice info . FYI, if you play next video, you’ll get different learning experience and it will probably make you stick longer in this post. But don’t worry though, it won’t hurt you. Storage cases are capable to hoard a lot of things. With a little bit of woodwork and creativity, you can make a floating organizer for your small bathroom. Cut two piece of pine boards at 23 1/8” and at 68 3/4”. Add ¾” pocket hole to your shorter boards. Use a clamp to hold everything together while attaching it with 1.25” pocket hole screws. Add the top and bottom braces to attach the cabinet to the wall. Add ¾” pocket holes to each piece and fill each pocket with wood filler. Use a scrapper to flatten it out. Stain the wood in Dark Walnut or any other color stain. Attach the cabinet to the wall using a stud finder to find the studs in the wall and mark on the frame where the studs will be. That’s it for our small bathroom. Next, time to dig our small bedroom. Having a small bedroom is always a bummer when you have lots of stuff and just no idea how to fit all of them in such a small space. An organized bedroom equals a comfort room to rest your exhausted body in. One has to really rack their brain when thinking of space-saving storage for a small room. The back of your closet door should make the cut when it comes to tiny space storage. Hang a slim wire basket to store non-heavy stuff like books, crafting essentials, or your knick-knacks. Better to hang one with lots of shelves so it can store many things. Instead of having your desk covered in clutter, keep your narrow items in view by storing them in a hanging wire rack. Use this clever vertical organizer idea for small bedroom and turn your room into a mess-free haven. Source, DIY Dollar Tree Over the Door Craft Organizer less than $5, Coat closet and wrapping paper. Floating storage is always a good choice for small space storage dilemma. Instead of crowding your bedroom with horizontal organizers, build a vertical one with two planks of wood boards and make two-tiered shelf with them. Mount them on the wall with narrow nooks on both sides. Here, your shelves yield a storage for lamp, clock, vases or book collection. Source: Alternative idea | Floating shelf with hidden storage. If small floating shelves just won’t do for your stuff, then deep shelves above the bead ought to do it. Consider removing some drywall to avoid extending shelves into the room itself. Create recessed spaces between the studs and you can opt to add doors to enclose them or install shallow shelf insert. The shelves would be great for storing luggage and boxes of off-season clothes. If building a DIY organizer seems like too much work but buying it is also not an option because you’re quit strapped on cash then what you need is hooks! Yup, hang your jackets, hats, bags or chunky necklaces on a grouping of interesting hooks. Attach several of them on the wall and if they are decorative then they will serve as wall décor as well! Video. With only one pallet you can make four shelves to store your book collection in your bedroom. Measure the inside of the bottoms of the shelves so that you can cut 2×4’s to size and screw them in place. Otherwise, all the books will fall out the bottom of your nifty new shelf. Sand them down to get rid of rough edges and corners. You can scrape the wood with a hammer and some nails to give some more character to it. Stain them with a brush by running it over the surface of the shelves one time, then immediately use a rag to rub in the stain. Source, Or this one.